Most people like fried food, but not the health issues often associated with it. in general, fried foods are dripping in grease, which as you might assume can lead to all kinds of health problems. If you consume them without moderation it could cause serious health problems. However, that is where air fryers come in to place. Air fryers are the way to fry foods without drenching them in oil. in our article, we will present to you with full reviews the top ten air fryers on the market today. Regardless of whether you’re looking for the budget option or for the best of the best we’ve chosen one for each category, and we have one for you, we make this list in no particular order. the electric air fryer tool have made cooking such an easy task, not only do they reduce time spent in the kitchen. But they also ensure that your food is cooked thoroughly from all angles, well in this article we break down the top other 10 best air fryers on the market this year. so if you’re interested in finding out which air fryer will work best for keep reading the second part of this article until the end. Also, and if any newer versions of these products are released any better products are released we’ll be updating our article on how well these are performing by customers. as we go through the pros and cons of each product. some might prefer low prices with good average quality, others may look for the highest quality regardless of the price. Is the air fryer good for you? Our way of picking products is based on different factors, from the user experience to the reviews and overall performance. 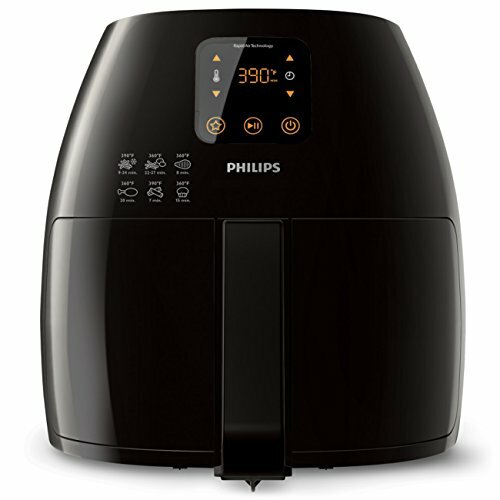 It depends from one to another on which is the best air fryer in 2019 to choose. 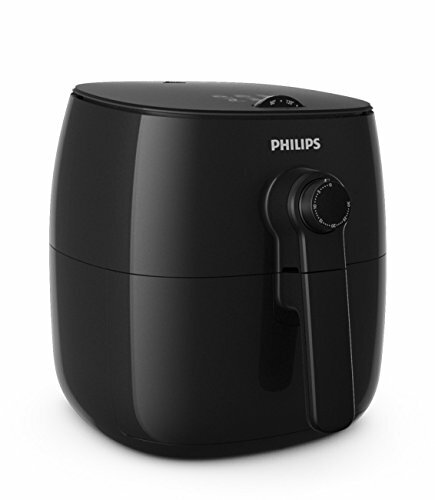 The First on our list as best overall, we chose the Philips fryer for different reasons explained by our experts. for those wanting an analog user experience, this air fryer turns out to be a solid choice. You’ll find a dial on the front used to adjust the time and the temperature dial embedded on the top edge, we especially love the placement of the temperature dial as it feels more solid and easier to adjust. It’s also embedded into the appliance, meaning the plastic shell is effectively protecting the dial, like other Phillips air friars. This one also uses a patented starfish and rapid air technology, to produce excellent cooking results. The design lets the air circulate around evenly to give you the crispy results you’d like while being tender and juicy on the inside, the unit will roast grill steam intake for best results for family and friends. And will even fry bacon a few strips at a time and a small pizza. The fryer will hold one point seven five pounds of French fries that will be crispy and tender inside, just add salt and vinegar or catch it and enjoy. Simply set the timer for up to thirty minutes and the automatic shut up will be to let you know time’s up, it will also give you a ready signal. The temperature is three hundred ninety degrees Fahrenheit, to give you crisp chicken meat send more you will never smell grease boiling with this air fryer since it uses none, housing stays cool and has that will never slip or slide on your counter surface. Overall, this air fryer is an excellent choice for anyone looking to get a quality analog appliance that does a fine cooking job. We do find it to be slightly expensive, considering the limited accessories that come with the unit. However, if you’re happy to fork over the cost, we highly recommend this little cooker. One more thing it’s endorsed by Gordon Ramsay. This one is From the American company that brings us heavy-duty tools and appliances, it’s no surprise the black and Decker air fryers are another such implant that is overbuilt to be durable and high performing. In fact, it’s the only one of a few air fryers that comes with a two-year warranty. It can a pledge to a long-lasting appliance be met with good cooking experience, in our testing we all concluded with a definite yes? 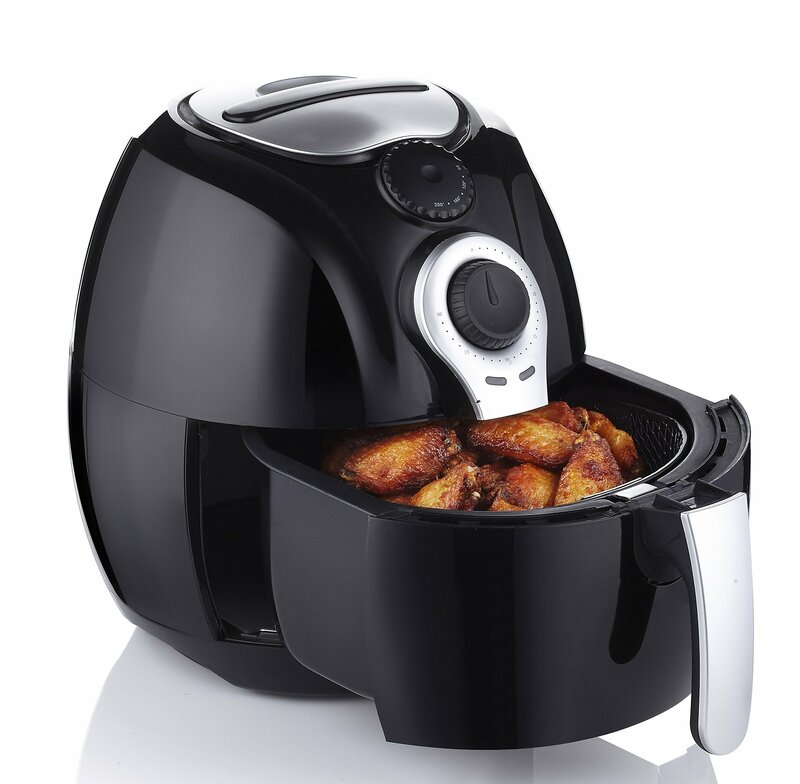 We found it to be an exceptional air fryer, with chicken wings, chicken nuggets, drumsticks hamburgers onion rings, and chips all being cooked evenly and having that sought-after crispy finish. We can thank the do convection fans that circulate hot air, evenly around the food. It is also a relatively small unit at two-pound capacity doesn’t expect to cook for more than two people, also contributes to each piece of food getting the airtime and desserts. Worried that your food like it burnt when you’re not around, black and Decker have solved this problem. Thanks to the auto shut off feature that turns the machine off when the timer expires. This unit comes with a mesh basket, and dividers so you can cook two portions of food at once. We also like that timer can be set up to sixty minutes, which is double that of other models such as the go why sort Avalon daycare fryer. On the top of the model, you’ll find two indicators lights, to know when it’s turned on, and the other for when the pretense richer is reached. This is a cool feature as it means you’re only looking at temperatures that you set rather than wasting time as it heats up, the accessories are fairly limited. But the cooking experience is one of the best we’ve seen, at the end of the day that’s the most important factor. If you happen to visit the official Phillips website you can find that their line of air fryers is, in fact, the world’s most popular. With over five million units sold, In many cases the popularity of a product isn’t always correlated with how good it is. but with Phillips fryer brand, nothing could be further from the truth. The XL contains a sixty-minute timer automatic on offsetting so you don’t have to sit around minding your food. To a conventional oven, you may think it’s too short, but when it comes to frying food. It gives you more than enough time as most recipes only take fifteen to thirty minutes, the most important aspect of any air fryer is how good it cooks the food, this appliance excels in this regard. The revenue technology enables you to fry grilled and roast food as efficiently as possible and keeps the smell down to a minimum. Perfect for shared living arrangements, there’s a lot of talk regarding the patented starfish design at the bottom of the cooking area. So what are the advantages of this, well combined with the rapid air technology? It circulates hot air around the entire unit to ensure all the food is evenly cooking, the fryer weighs in at fifteen point four pounds with a capacity of two point six five pounds. It’s a pretty hefty unit and leaves a large footprint on your tabletop, it is perfect if you’re looking to feed around for people. If you’re a single person, or couple it’s better to look for smaller Phillips fryer the one we previously mentioned. unlike the other air Fryers on this list, which had the same look which leads us to speculations that they’re made from the same factory. this one looks like it was designed from the ground up, this air fryer solves one main issue that plagues all air fryers flipping the food over. Most air food fryers require the user to take out the basket midway through the cooking and then flip the food over. How does the TFAL solved the issue is all this simple, they use a paddle, strikingly rectangular an oval shape unit houses the paddle that sits in the middle of the pan. And slowly rotates to turn the food over, We loved the super simplistic design as we know that air frying doesn’t require too much temperature monitoring. And that’s apparent that the T-Fal have implemented this knowledge in the design, it contains only an on-off button and a timer control that displays a digital countdown. Which can be set up to ninety-nine minutes. There’s no temperature dial with this unit heating up to three hundred thirty-eight degrees Fahrenheit, and staying there into the design almost hits a home run, but fall short on the timer implementation. Once the timer expires there was no auto shut off, with only a buzzer sounded which something missing. It means the unit will continue cooking your food until you manually turn it off, wiles this job was made easier due to the steam-free viewing window. still, the relatively annoying thing that you need to be around when cooking is nearing completion, in regard to cleaning it’s a straightforward and accessible process with the pen led and paddle all being detachable and dishwasher friendly. You can also purchase a mesh basket, to help close more delicate items. This will make the cleaning job slightly harder. Two point nine-liter capacity means that the two-point two pounds of food can be cooked at any one time, which means you can produce more than two servings in. be prepared for Next on our the list as the best design. 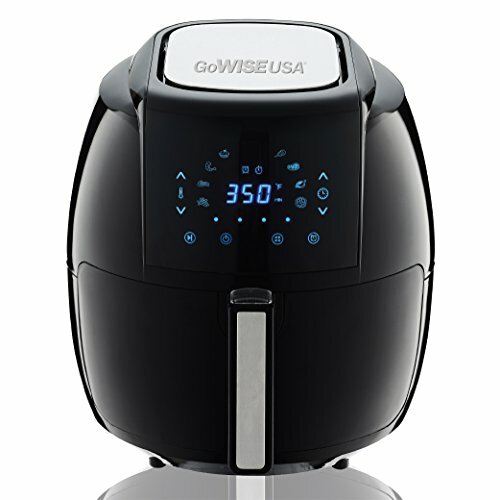 GoWise is another such a popular brand that has implemented the digital interface to create a more user-friendly air fryer. It has a beautiful design and looking. The GoWISE product is the fourth generation electric fryer which features seven presets to easily have cooked chicken, steaks, fish, meats, shrimp, chips and Kate. It also allows you to manually adjust the temperature and time that is required, when cooking is complete special sound will be on. And the unit will switch to standby mode. Which is the most important feature. Food sits in a detachable, non-stick coated cooking basket. Which itself sits in a draw, the smart design means that when you pull out the drawer you can then detach the basket via a button card. Which prevents the draw from dropping off. The important parts that you need to clean is the cooking basket in the drawer. Actually are all dishwasher safe to make the job super easy class with the warm water should be able to get the job done. what Must be noted is that the timer goes only for thirty minutes, which is enough in many cases and it depends on what the user is willing to cook with it. But it would have been better for it to go up to the standard as we have seen better timings in other models. The presets make the job all too easy and the included fourteen-page recipe book is a great thing for beginners. However the lack of accessories Such as Panzer, racks make certain foods tricky to cook and degraded basket well great for draining oil can be a bit of a pain when marinating are using the liquid ingredients. The good news is that it does come in a thirteen point seven court or five-point eight-quart variety. So you can pick which one suits you, overall it’s flashy and sleek and will look great in a modern kitchen. With a good price and one year warranty and the goal was an electric fryer comes with our recommendation. This one may be the perfect kitchen tool for you, this product has a compact and somewhat cylindrical design which guarantees that it will not take too much space in your counter. 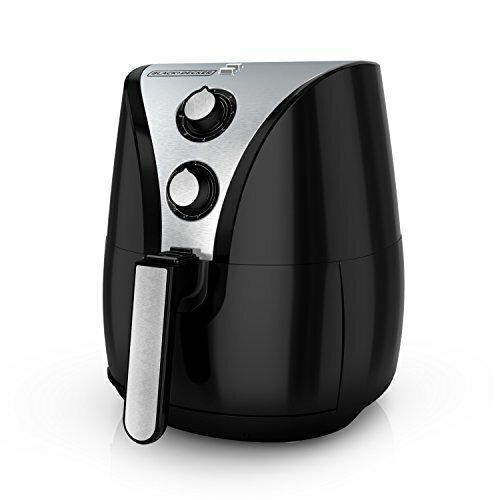 Moreover, the combination of black and silver gives the air fryer a traditional yet classy look. Since this product does not require any particular air fryer accessories, customers are free-use any pan and baking utensil which can fit inside the item. The cooking basket is removable and is nonstick in nature to enhance the durability of the product. just like any good air fryer, the product serves to ease our cooking nightmares. By delivering an array of functions ranging from frying to grilling. Moreover, it allows you to adjust and control the temperature to cook your food at thus providing customers with autonomy. the performance of this product has exceeded and satisfying the masses features, like ready-alert auto shutdown and a drip pan make this 10-pound air fryer of what it is. Overall this product is perfect for you if you value safety and wish to have more autonomy over the cooking process. the addition of extra features, to ensure the safety the customers have made the smart health oil-free LCD deep fryer and item worth buying. If you do consider yourself to be a health freak, and you want to reduce the amount of fat in your food. then this air fryer is what you have been waiting for. 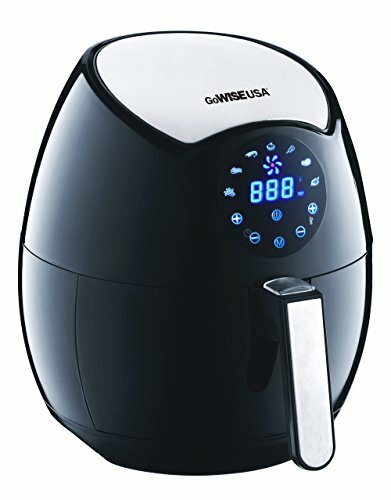 This 14.2 powered air fryer has an internal capacity of 3.3 quarts, which is sufficient to satisfy a few, the product is available in red white and black colors. Each of which is bound to go well with a sophisticated aura of your kitchen, the product features a simple design with a cooking basket situated at the bottom of the fryer. The given mesh basket is detachable in nature as well this addition makes the product easy to wash, and convenient to use. The digital character of the atom also makes sure that you’re aware of the settings your food is cooking on. this item comes equipped with a few air fire accessories, which allow the digital air fryer to be used for grilling, baking and roasting the key objective of this air fryer is to deliver low-fat food, which is met via the rapid air circulation technology. Electric air fryer Gowise USA’s latest installment gw2261 is an electric choice, which is oil-free dishwasher safe. and equipped with various safety features, if you wish to purchase a complete package, this may be it one of the additions. The company has made to its latest electric air fryer is the touch screen option, this addition has given the product classy and easy to use by the user which has been appreciated by the faithful customers of the GoWise company. The product is marked by an array of features, one of which ensures that the detachable basket does not slip when you’re cooking. hence, avoiding some kitchen related hazards, especially when you add the large capacity of 4 points 2 quarts into the mix. 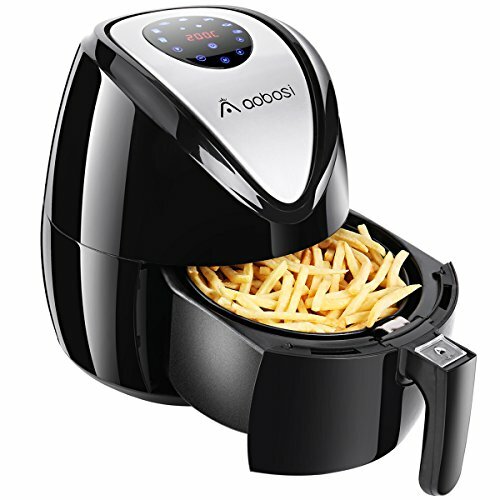 With the stylish accessory for the kitchen which yields several functions, this is perfect for those who wish to have the best of both worlds eating fried food, without consuming additional fat. Such a feature is achieved by the lack of need for oil while making the food, which guarantees that you do not consume those extra calories. Moreover, most customers agree that this electric air fryer is marked by the high-quality performance of the fryer is guaranteed. By the use of hot air technology, where the fan situated at the top which is responsible for cooking food through and through, such a the feature enables high-quality output. And hence an excellent performance of the product. One of our visitors asked us about these air fryers that you can use for a whole bunch of things from making French fries to you know other types of things, and even though it doesn’t use oil to cook. They were concerned about that particular cooking method, and whether or not it’s good for us in along. that same question a lot of my viewers asked me. What the benefits are to eating raw versus cooked ones so in this part of the article we are going to answer that question. because what our answer is going to be with regards to the fryer methods of cooking such as baking so without further talk. let’s go ahead and get started again answering that question. So many people have taken the action to use these fryers because you can Get some foods that normally are loaded in oil and cook them without oil. so the low-fat vegans can still have French fries and other types of vegetables and actually stay in shape. All done without Oil, and it sounds like a really good idea, the fryer cooks by circulating hot air around the food in a fan circulates the hot air around the food at high-speed. By cooking the food and producing a crispy layer, Now Traditional frying methods induce this effect By merging these foods in hot Oil. However, with the air fryer when the circulated air is heated up to about four hundred degrees Fahrenheit, it initiates this reaction. 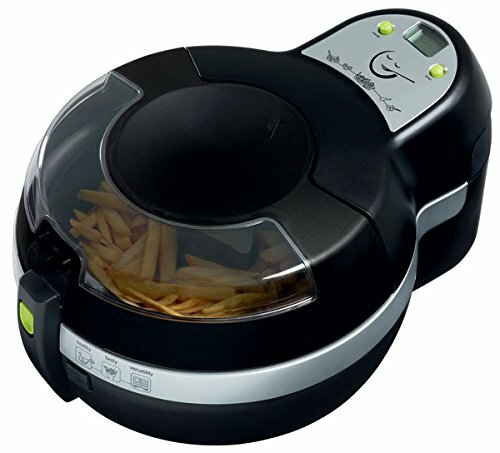 By doing this the appliance is able to fried foods like a potato chip,s chicken, fish, steak, French fries or pastries. while actually using a little to no Oil. whether it’s Donuts, french fries, chicken or Oreos. fried food is everywhere, and it’s delicious. I mean isn’t that why we all go to fairs, besides making our taste buds happy deep-fried foods. Also, involve some really cool chemistry. From the cooking process itself to the kind of oil and battery you’re using when you submerge a piece of food into really hot oil, a bunch of chemical reactions starts happening cooking your food and giving it that crisp outer layer. Typically you’ll want the temperature of the oil to be around 180 degrees Celsius, but that varies depending on the recipe you’ll know the oil is hot enough when you drop some food in and it starts bubbling. Now some people might think that that’s the oil boiling but it’s not, it’s actual moisture boiling off the surface of the food since the temperature of the oil is near twice the boiling point of water. as the water leaves the food two things are happening first the food surface dehydrates, and a crispy crust begins to form. But also the escaping water molecules leave gaps that let oil molecules enter the food, which is what researchers called the oil uptake. in fact some studies have shown that the amount of oil uptake is directly proportional to the amount of water that’s lost, more oil increases the food’s fat content and therefore its energy content. Also known as the calories, and if too much oil gets absorbed you might be left with a greasy mess of a meal. but you don’t want to take your food out of the oil too soon either, otherwise, the outside won’t be hot enough for long enough to cook it all the way through. that’s because cooking is all about heat transfer when food is in a deep fryer the outside layer of molecules is heated up thanks to convection. from the currents of hot oil flowing around then all of those food molecules start bumping into each other and transferring heat energy. So the inside is heated because of conduction so those are the basics of deep-frying food, but there’s a lot more that goes into making a tasty corndog. like what happens when you add to batter or a breading to the outside of your soon to be fried food, well a batter is basically an extra layer between the food and the hot oil. So the batter is mostly what’s getting dehydrated, well that heat transfer is still happening only this way the food at the center holds on more moisture and doesn’t get too dry. As fish and chips, fried chicken and tempura lovers will know, a little batter can also let you add more flavor to the food. and give it a crunchy textured crust, you can even add beer to your batter to make the crust softer and crispier. that’s because the carbon dioxide in beer forms bubbles that fluff up the batter and foaming agents which are certain proteins found in beer, keep those bubbles from bursting as fast as they normally would. Plus the ethanol in beer evaporates faster than water because alcohol molecules aren’t as strongly attracted to each other as water molecules are. This means the batter will dry out faster so the food doesn’t have to be in the fryer as long to get a crispy crust. But one study did show that beer batters do have more oil uptake than water-based rice or wheat batters, so calorie counters are warned. you might also have heard that some oils are better to use than others when frying food, different oils are made up of different kinds of fat molecules. or lipids and have different nutritional benefits. they can also affect the flavor of your food because they break down differently see every oil has something called a smoke point. a temperature where it starts to create smoke, which can give the food a bad taste. Basically, the heat causes the lipids in the oil to break down and produce some volatile compounds. which are chemicals that easily can become gases, some of these leave the oil and enter the nearby atmosphere as smoke. ?but others can enter the food and change its flavor, foreign oil, for example, is made up of lipids with lots of double bonds. also known as polyunsaturated fats, and it tends to break down more easily at lower temperatures. That’s because polyunsaturated fats have some weak carbon-hydrogen bonds which break and set off a chain of chemical reactions that eventually produce volatile compounds. so when you’re deep-frying something you’ll probably want to look for an oil that has a high smoke. Point and most vegetable oils fit that bill, deep frying food is a lot more scientific than you’d expect. you have to apply all kinds of knowledge about heat transfer, and fat content, so that your food is actually edible. so treat this as some food for thought the next time you’re eating some delicious hot french fries.